These next 2 games are extremely important! As the team photographer I am SO proud of these boys! At various times during the games I capture both the game and the boys and coaches, trainers etc on the bench… its intense, its encouraging, its truly for the love of the game! Hearing the boys talk each other up, encouraging words, cheers, its amazingly uplifting and I am SO proud to be a part of it! 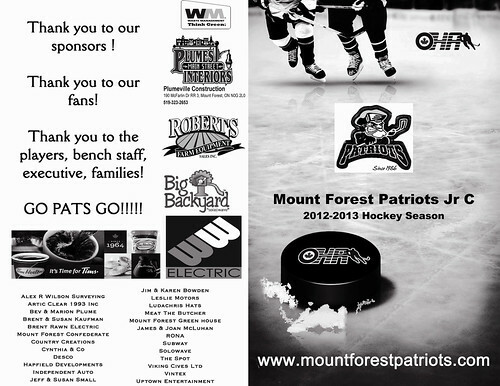 We would love for you to join the fans to cheer on the Mount Forest Patriots! On behalf of the Patriots I would also like to extend my own thanks to all the Sponsors! We have two three sponsors who have very genorously donated prizes for tomorrow nights games. Coburn Insurance of Mount Forest – Donated 2 $25 gift certificates for restaurants in Mount Forest! Pike Lake Golf Course – 3 sets of a pair of Green Fee’s – one pair to be given out during each period! WW Electric – Thermos and Lunch box! And… as much as my dad (Jamie McLellan) does not want recognition at all, I have to give him props for the unbelievable amount of time he has put into this team for the years he has been involved and especially these past two years. He truly is someone I look up to and admire simply for this dedication and amazing business knowledge. Even though every minute he spends working for the team in any way, he is doing it entirely as a volunteer and for the community! He stepped up when the team was near the end, he has dedicated many long nights, has spent a lot of time to gain sponsors and get things organized. I am SO thankful now that the team has made it into the Playoff’s to see the smile on his face and gratitude towards the community for their support during these past (intense) few weeks. Of course as much as dad does put in a lot of time, so does the rest of the executive, who also are extremely appreciated and Cherie and Mike Noble have been involved since the beginning, as well as Heather and Stu – so greatly appreciated and have been involved for years! This team is FOR the community. 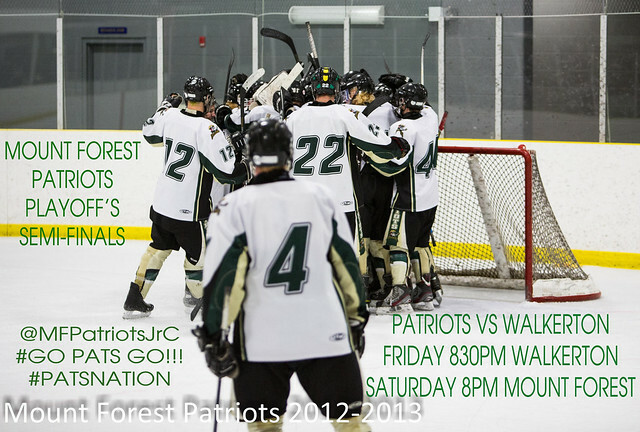 Wear green to support the team Saturday night back at home 8pm in Mount Forest! We would also like to thank Derek Bridgewater for providing trivia questions and a ticket giveaway on the Mount Forest Minor Hockey website! For some extra exposure for the sponsors… thank you!!! 1. 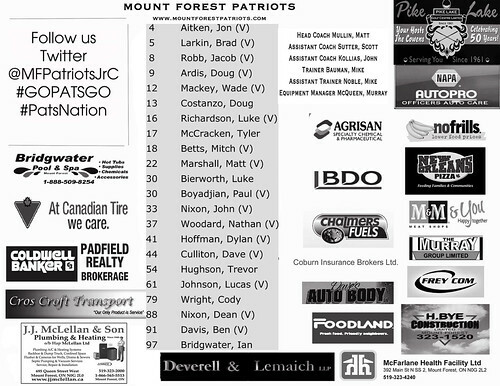 The Mount Forest Patriots Hockey Team is a NOT For Profit – which means there is zero profit made by anyone. Its not about that, its about a community sports team. 3. Everyone that helps out with the Patriots hockey team are all extremely dedicated volunteers. 4. The Mount Forest Patriots Jr C Hockey Team has been playing since 1986. I personally remember spending many weekends in high school at the games.